So, the game freezes, the list of statistics pops up and we can hear a typical audio file. And, after that, the game loads the next level, of course. 1. The background audio stops. 3. Then the game freezes and the Statistics Screen pops up. 4. Hit ESC. - This is the way to close Statistics Screen and make the TriggerGroup go on. 2. Nothing will be activated if the game awaits the player to hit ESC. That's why you can't place the audio triggers between the triggers of the Statistics and the level-jump. 3. When the player hits ESC then the game will be active for a short moment, after the frozen state expired, before the loading starts. Lara has just jumped back, to grab a ledge and hang down. Under her, there's the square with the TriggerGroup#1-activator trigger. So the game freezes, the Statistics Screen pops up. 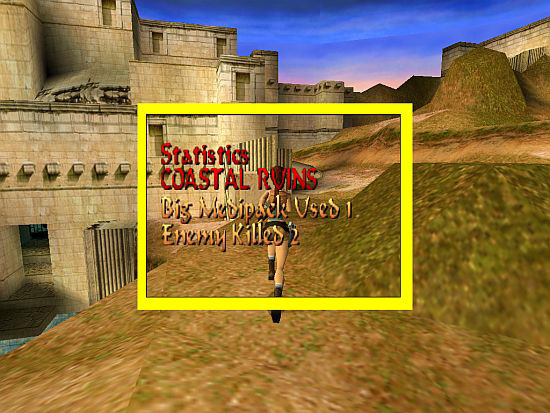 The player releases CTRL and hit ESC. The game will be active for a moment so the player will see Lara falling down before the level-jump, because CTRL isn't just pushed down. 4. It's not a problem if you use that setup at the 'temporary end' of a level - i.e. if you can get back to that level later. Moreover, actually, you can use the setup anywhere in the level (reform that to work properly under the new circumstances: for example, you don't need level-jumping trigger in this case, of course), 'just to show the Statistics for the player, before (s)he continues playing'. Is Lara just riding a motorbike when jumping to the other level? You don't need to use the Statistics Screen everyway. I.e. you can use your own statistics, if you want. a, You will use a background picture where the statistics entries will be written on. - Save the picture in Pix subfolder of Level Editor main folder, with name 'Image', an ID and BMP extension, for example, as Image11.bmp. The magenta part should be transparent in the game. The Image#1 command says it will use Image11.bmp, placed it in '250, 250, 500, 500' position. IF_TRANSPARENCE means the magenta part will be transparent. The presence of the picture will freeze the game (if it doesn't, then the Image#1 command had an IF_POP_IMAGE constant). IF_QUIT_ESCAPE means you will delete the picture off the screen by hitting ESC. So the text will be red, and in '300, 300' position. It means 1 will be added to Local Byte Delta1 variable every time when Lara uses a big medipack. As you see, the 'Big Medipack Used' text and its actual value (#0048 means the value of Local Byte Delta1) - i.e. 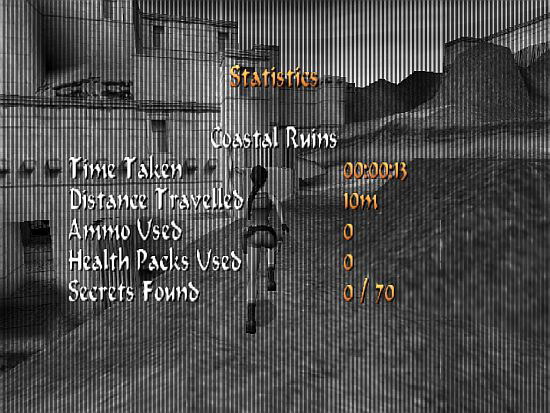 how many big medipacks Lara's used so far in the level - come from ExtraNG #1 entry now. So the text will be colored gold, and in '300, 400' position. As you see, the 'Enemy Killed' text and its actual value (#0800 means the value of Current Value) come from ExtraNG #2 entry now. So the text will be colored gold, and in '300, 450' position. As you see, the example above shows level data and not game data. First of all, Lara activates TRIGGER(20560:0) for FLIPEFFECT(244) trigger at the start of the level to define the killed enemies actual value. 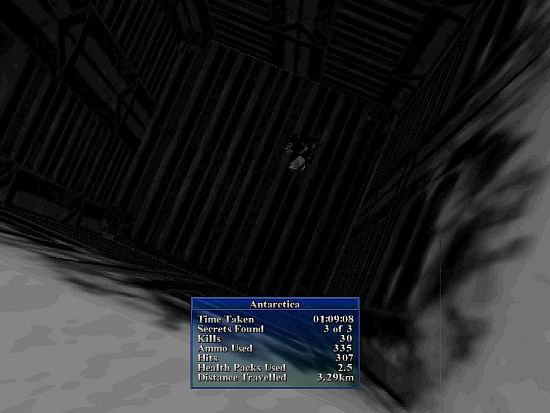 The first part of the operation is defined in TriggerGroup#2 that is activated at once (see '0, 2' in Organizer= 1) when Lara reaches the end of the level. TriggerGroup#2 stops the background audio ($2000, 130, $0), starts 044.wav ($2000, 129, $2C), prints the title+level name ($2000, 203, $100), and prints the bigmedi data ($2000, 203, $201). Then calculates the 'killed enemies' data ($2000, 244, $50FF, $2000, 286, $50) and prints that ($2000, 203, $302). The second part of the operation is defined in TriggerGroup#3 that is activated (see '1, 3' in Organizer= 1) 1 frame after TriggerGroup#2 has been activated. TriggerGroup#3 puts Image11.bmp on the screen ($2000, 217, $1), and - if the player hits ESC so that TriggerGroup#3 can continue - loads Level#2 ($2000, 82, $2). Be cautious with the setup if it contains level data and not game data. For example, do you want that value of the big medipack (Local Byte Delta1) to be zero when Lara comes back to the level? Because, if you make that zero (somehow), then the Statistics will show you partial data when Lara leaves the level (finally, this time). But if you don't make that zero then the partial data of the first level part and the partial data of the second level part will be added in the Statistics at the final end of the level and shows total big medipack data on the level. As you see above, you can do text-forming customization on your Statistics (color, position etc.) - anyway, whether you use the original Statistics or some new one. Caring about forming texts is a bit complicated in NGLE so I decided I'd show you all the forming rules, and not only the ones about the Statistics. - OLD TEXT: texts you can also find in TRLR or TRLE: texts in the inventory, in the Statistics Screen etc. - NGLE TEXT: texts (except Ammo and Feature Text) that the new NGLE features use: the amount of done rotations (parallel bars), the text for the standby effect, the timer of 'Enemy. Timer. Show the trigger count-down for <#>enemy using (E)format' ACTION trigger etc. - Defining basic fonts (except Feature Text) for all the levels of the game: see font.pc in graphics\wads folder. - Defining fonts (except Feature Text) for a given level: put a FONT_GRAPHICS object into the WAD of the level (see: new font demo project of Paolone), then use NG Font Editor in NG Center\Tools. - Defining fonts for Feature Text: see WindowsFont Script command. Customizing of the level texts, the customization command must be placed in a [Level] block usually. Customizing of the level texts - if you want the validity of the customization for the whole game - or the title texts, the customization command must be placed in [Title] block. - Customizing (in Script) Old Text sizes: see TextFormat Script command (only SizeCharacterMenu field is valid now), placing that in [Title] block. Valid for all the Old Texts of the game (except: the text of Legend Script command). - Customizing (in Script) NGLE Texts: see TextFormat command (every field is valid now, except SizeCharacterMenu), placing that in a [Level] block. - Using an NGLE feature like that in the title you can use TextFormat in [Title] block to form the text of the feature. - Customizing (in the game) NGLE Texts, if they can be affected by TextFormat command: use 'Text. Set' FLIPEFFECTs. It overwrites (on that level) TextFormat command values or the latest similar 'Text. Set' trigger of that level. It works for the texts that are just written or the texts that will be written. It is valid only on that level, until the next FLIPEFFECT like that. - Annulling (on the actual level) every effect of TextFormat command or all 'Text. Set' FLIPEFFECTs for the NGLE Texts that are just written or the NGLE Texts that will be written: see 'Text. Reset all text formatting settings with default values' FLIPEFFECT. - Customizing Ammo Text: see CUST_SHOW_AMMO_COUNTER Script constant. Place it in a [Level] block usually. Place it in [Title] block, if you want it to be valid for the whole game. - Customizing (in Script) 'A' type Independent Texts: see TextFormat command (every field is valid now, except SizeCharacterMenu), placing that in a [Level] block. - Using a text like that in the title level you can use TextFormat in [Title] block to form the text. 'A' type Independent Texts are the texts that will be written on the screen by a FLIPEFFECT that doesn't use a PARAM_PRINT_TEXT Script constant. - Customizing (in the game) 'A' type Independent Texts: use 'Text. Set' FLIPEFFECTs. It overwrites (on that level) TextFormat command values or the latest similar 'Text. Set' trigger of that level. It works for the texts that will be written. It is valid only on that level, until the next FLIPEFFECT like that. - Only the proper FLIPEFFECT can be used. - Annulling (on the actual level) every effect of TextFormat command or all 'Text. Set' FLIPEFFECTs for the 'A' type Independent Texts that will be written: see 'Text. Reset all text formatting settings with default values' FLIPEFFECT. - Customizing 'B' type Independent Texts: see PARAM_PRINT_TEXT Script constant. 'B' type Independent Texts are the texts that will be written on the screen by a FLIPEFFECT that uses a PARAM_PRINT_TEXT Script constant.